So it might only be half-time, but what an impressive first-half it was from Manchester City. The second leg, which takes place on 15 March back in northern England, *should* be a straightforward affair for the Premier League side. If only their neighbours Manchester United had it so easy. Join us again tomorrow when we find out whether Louis van Gaal's men can avoid a Europa League embarrassment against Danish minnows FC Midtylland. See you then! Sergei Rebrov has grim expression on his face. Not surprising really - his side face an uphill battle to reach the quarter-finals. "Of course we are disappointed but we made a lot of mistakes in the middle of the pitch. 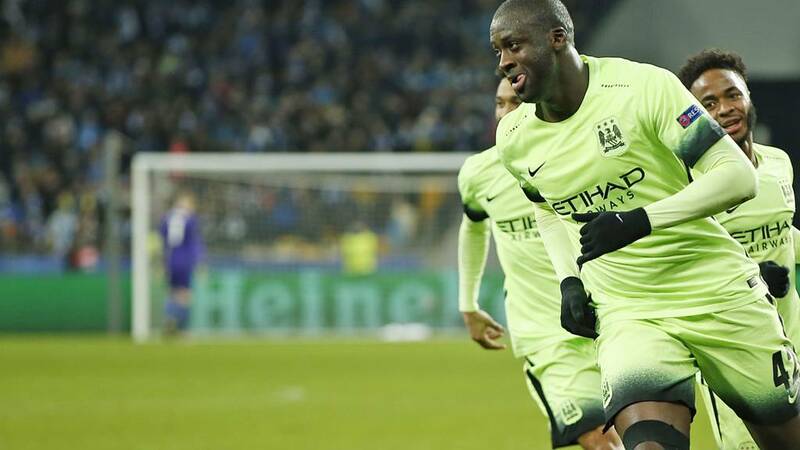 That is not acceptable against a team like Manchester City," the Dynamo Kiev manager tells BT Sport. "The winter break didn't affect us, the fact is we played one of the best teams in Europe. The players were a little nervous, it was their first time in last 16 and they felt that. When Man City scored we lost confidence. "When we scored I hoped we could get back into it. We had chances but couldn't score." As our man John alludes to, City have long known the importance of topping their group. Finish top, don't draw the mighty Barcelona in the last 16. Simple. "It is important to improve every year and we have been unlucky to play Barcelona in each of the past two seasons," Blues manager Manuel Pellegrini tells BT Sport. "Now I hope we can advance one stage after that. And when it is just the eight best teams in Europe anything can happen." John Madrid: Dear Arsene Wenger, do you still not see the benefit of winning the group? Arsenal fans still seem to be feeling Tuesday's pain. Manchester City manager Manuel Pellegrini might well be justified in his decision to play the kids at the weekend, but he isn't one to crow about being right. "Unfortunately we have just 13 fit players, we had four defenders on the bench tonight and two young players," he tells BT Sport. "So it is important to have the return of important players and important to make changes. That's difficult at the moment but I hope some attacking players will return soon." Manchester City manager Manuel Pellegrini, speaking to BT Sport: "I'm very happy because it is a very good result. "It is not finished but playing away and having a two-goal lead is very good. The team played well and had lots of chances. Maybe when it was 2-1 we had moments of doubt, but then we got the third goal. "Is the tie settled? No, it is important in football to never think it is finished. But to have that third goal gives us more confidence for the second leg." One result of note to tell you about in the Scottish Championship tonight - with Greenock Morton winning 3-0 at Hibernian. The result means Hibs remain eight points behind leaders Rangers. "Man City were very, very good – there was a little spell at the start of the second half when Kiev came at them, but in the end City might feel they could probably have won by another goal or so. City won this game comfortably. Yes, Kiev had 11 weeks off but that was not City's problem." Our chalkboard can't do the quality of Yaya Toure's finish justice. But it can show you how brilliant City's patient build-up to the third goal was. Dynamo were chasing shadows as the visitors knocked the ball around the defenders like they were training ground cones. Manchester City captain Vincent Kompany speaking to BT Sport: "The performance was good, with a lot of high pressing, 3-1 is a good result and we are happy with it. "Joe Hart is an unbelievable keeper. When he was called upon he did it well. "We are going into the second leg with a fairly good chance to go through, which has not been the case before. We looked like a team that was hungry for success tonight. "I feel like I am contradicting myself a little after the FA Cup but I feel like every cup is a priority. Every game is a priority. It is not easy to predict which competition you will do well in." Jacob Butterfield's early goal was enough to secure three points for Derby, who move up to fifth in the Championship table. I know, I know...it is only half-time of this last-16 tie. But would anyone back against City reaching the quarter-finals for the first time? Probably not. Matt Price: Three away goals AND victory. I bet Pellegrini's waiting to serve up humble pie to those who criticized his FA Cup choice.